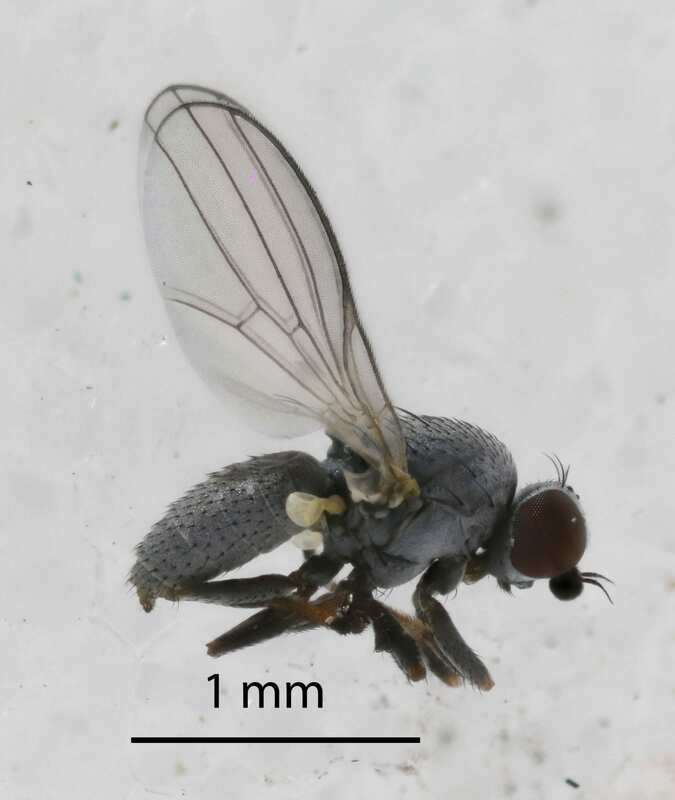 The silver fly species Leucopis argenticollis and Leucopis piniperda are abundant predators of HWA on the West Coast. Our work focuses on bringing silver flies to the east coast so that they will feed on HWA. Since silver flies are spring feeders of HWA, our silver flies releases complement the fall releases of Laricobius beetles. Silver fly larvae feed on the eggs of both of HWA’s annual generations, and they are released starting in the early spring until the second generation eggs hatch in late spring. 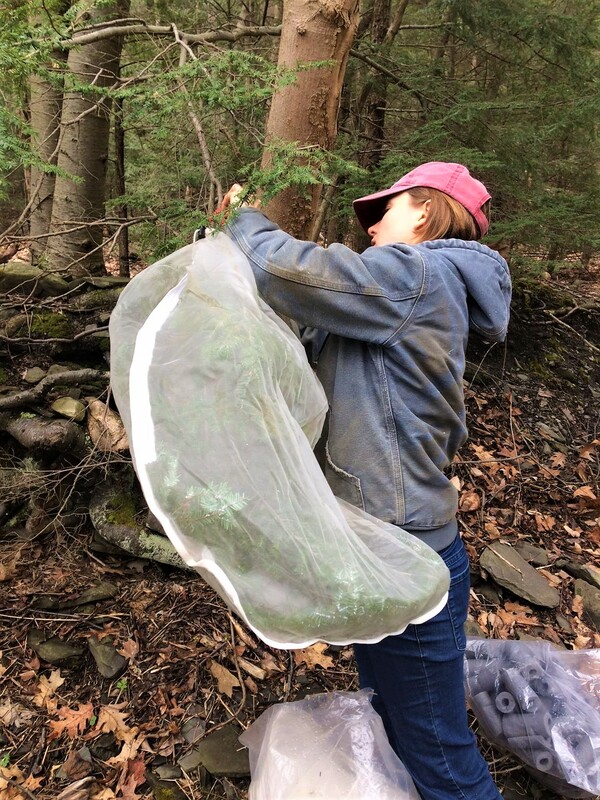 Silver flies are released into mesh bags that have been placed over infested hemlock branches. Twigs from each bag are typically sampled for larvae to assess signs of establishment on each contained branch. We return periodically throughout the season to monitor progress at each release site. The New York State Hemlock Initiative conducted the first releases of western silver flies on the east coast in 2015. That release took place on the southwestern shore of Skaneateles Lake. In 2017, the NYSHI team released silver flies at 10 sites and found signs of reproduction at each site. 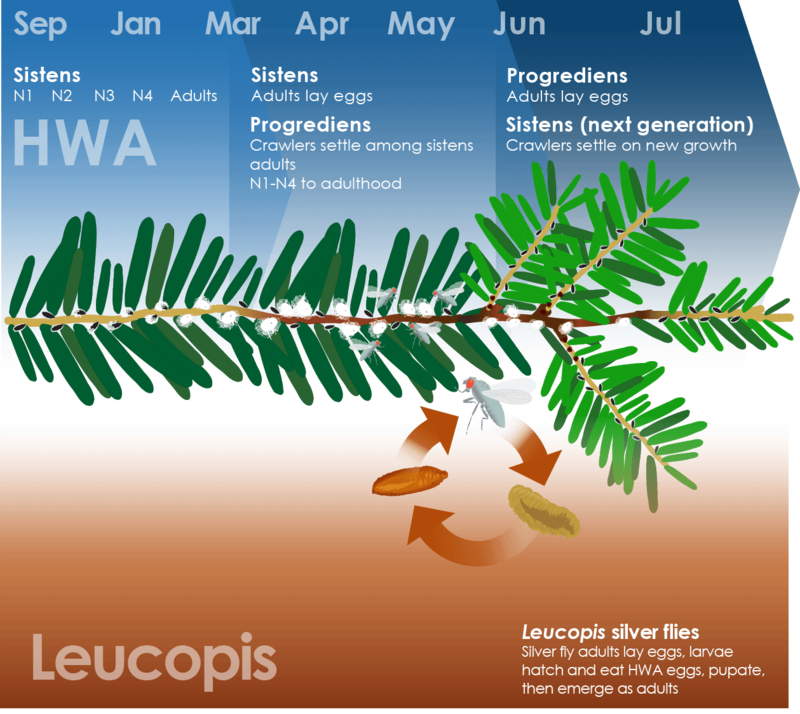 Leucopis silver fly larvae feed on the eggs laid by the sistens generation of HWA, reducing the number of HWA individuals of the progrediens generation that will hatch. Silver flies lay their eggs on the twig among the HWA, and hatch into larvae, which feed, pupate, and become adults. This cycle repeats throughout the HWA egg-laying season. We still do not know how many silver fly generations will take place during a given season. Recently we have developed protocols to rear flies into their second generation in the lab, a process that has never been done before. We hope that this research will lead to a better understanding of the relationship between silver flies and HWA in the field. Our HWA Phenology Project aims to better understand the timing of HWA’s major life stages across climate and temperature gradients in New York, especially when it applies to biocontrol releases. Our silver flies are released when HWA is actively laying eggs, so our phenology volunteers act as our eyes in the field, alerting us to when HWA egg-laying is taking places in their area so that we may release silver flies. Tree health volunteers help us identify potential biocontrol release sites by assessing tree health and the progress of local HWA infestations. We look for infested trees in relatively good health, low branches, and with high densities of HWA to provide good food resources for biocontrols. You can learn more about help us identify release sites on our Community Science page.